Apartment located in a colonial house (1902), totally recycled, conserving its original structure. Located on the second floor of the building, reachable by stairs. The apartment has a big area with a double bed, table for 2, armchairs and TV. The kitchen has an American bar and 2 stools. This space is fully equipped with all the stuff you need to cook. The bathroom is complete. It has a Jacuzzi for 2. Furthermore it has windows that provide natural light. The apartment has a very big terrace of 25 square meters with a wooden table, hammock, 6 seats, and a barbecue to prepare typical Argentine “asados”. It can be used as a solarium because it has a shower for sunny days. Encantadisimos con el dpto. Tal cusl lo vimos. Disfrutamos mucho la terraza y la parrilla. Tan contentas quedamos que ya elegimos el dpto para nuestra proxima estadia. Muchas gracias. Excelente como siempre, departamento muy comodo y cerca de todo. It was a plaesure to be in this appartement. Nice appartement. designed with love. A lot of details. Only the kitchen is a little bit small,if like to cook more than the breakfast. Balcony in the court is very charming. The situation with the court, commone area give place to have contact with the neighbars. We had a great time at Mercedes\' apartment. The main room is spacious, the terrace is lovely, and San Telmo is a great place to stay in Buenos Aires! Apesar de não ter conhecido Mercedes pessoalmente, fui muito bem recebido pelas pessoas que trabalham com ela. O apartamento é, realmente, incrível e faz justiça as fotos divulgadas. Ar-Condicionado, agua quente, internet, televisão com varios canais, tudo funcionou com devia. A localização do apartamento é muito boa e tivemos o privilegio de conhecer bem San Telmo. Tenho apenas uma pequena ressalva, o apartamento fica no terceiro, e ultimo, andar e não existe elevador. Então para chegar no quarto é preciso subir uma boa escada, não foi problema algum para mim e minha mulher, mas eu sei que não é para todo mundo. We really enjoyed our stay in the apartment and had a lot of fun going out to dance tango. Thanks a lot! Passamos 3 dias muito agradáveis, adoramos o Bairro de San Telmo! Fomos recebidos no horário combinado, e todas as informações necessárias foram passada com antecedência. Quando voltarmos a BA certamente faremos contato novamente. We had a great time at Mercedes place, it\'s a nice little apartment in the middle of all the action in San Telmo. The agent managing the property was very helpful and made our last few days in South America great. El apartamento es muy fiel a las fotos: encantador y cómodo. El balcón es precioso y nos encantó la oportunidad de hacer una parrillada. La cocina es pequeña pero adecuada. La ubicación es buena, cerca de los principales lugares de interés turístico de San Telmo, y aún así cerca del centro. La asistencia de Casa San Telmo, que está ubicada en el mismo edificio, es muy buena. Sólo tuvimos problemas con el agua de la ducha que se enfría rápidamente. We absolutely loved the apartment: located in a nice area of the city, allowed us to quickly get to other places; it was comfortable, warm, sympathetic and humane. Clean and tidy, allowed us to get closer to the reality of South America with peace of mind. We had an excellent stay in San Telmo. The area is great and the staff was very kind!! Great location and fabulous apartment with real character. Wonderful terrace too. I would stay here again. My partner and I spent 5 nights at the Casa San Telmo apartment and were so impressed by the whole experience. The location is fantastic for exploring the neighbourhood of San Telmo and the apartment itself was beautifully decorated and renovated. Everything you needed for cooking and making yourself at home was available, and the beautiful deck outside was perfect for relaxing on. We thoroughly enjoyed our stay and would recommend Casa San Telmo to anyone looking for a great place to stay while in Buenos Aires. Beautiful loft in a perfect San Telmo location. The many charming details and gorgeous terrace make this place uniquely special. Great cafés and restaurants are nearby in every direction, and Mercedes was a fantastic and helpful host. I would strongly recommend this spot to anyone visiting BA. Such a great place in that wonderful town! Er would highly recommend this place!! Lovely apartment. It is just the basics but for the price it was great. Very comfortable. We loved the patio, this would be a fantastic spot if your visiting in the summer. Excelente! departamento de calidad, bello, ubicación ideal, Precio excelente! 100% recomendable! El lugar es muy agradable y tranquilo, la atencion por parte de las partes involucradas estuvo correcta cumplieron en todo momento en tiempo y forma, muy recomendable, el departamente tiene todas la comodidades, estas en pleno centro de san telmo, la verdad que repetiria. Host is wonderful, knowledgeable and extremely helpful. She provided excellent local information in response to my questions and included me in her social diary so that I could experience authentic tango. Warmly recommended. This apartment was fantastic! It\'s in a great location, walking distance to so many interesting things to see and do. Independencia subte is close as well so you can get on the subway and Suss out the rest of the city. If you walk up Peru and the surrounding streets you end up at av Florida, plaza de mayo everything. Very clean, beautiful Terrece. Really enjoyed our stay, so worth it. We had a great time at this apartment in San Telmo. it's a great area with a lot of culture. the apartment has EXCELLENT security and facilities. showers were the hottest i've come across in south america, period. really clean, really bright. We had a wonderful stay, it's a lovely apartment. San Telmo is a nice area, although busy: the apartment is a nice point of rest. I would recommend this apartment to anyone in a heartbeat! The location was perfect and the apartment itself was just too cute for words. I would also highly recommend the local bakery just down the street, so many yummy treats! The owner took very good care of us. She treated us like family. We loved sitting on the big terrace having coffee in the mornings. My boyfriend and I stayed 4 nights at this lovely studio and I wish I could have moved in! It was huge and clean and very comfortable, and the bathroom was enormous and had a great jacuzzi bathtub. We cooked dinner and ate outside on the lovely terrace. The location was great and the owner was so helpful! Really loved this apartment, and it was also a great deal. The apartment was super cute... one of the cutest places we've stayed but a few things weren't working, which we were told upon check-in... so eh... didn't bother us too much, but would have been great if everything were in tip top shape. This said, everything was clean and the AC worked which was great as it was a tad warm while we were there... we're pretty easy travelers and realize that not everything is perfect all of the time. As far as location, it is awesome! A few blocks to Plaza Dorrego and the Sunday San Telmo market... the building felt VERY safe - had to get in through 3 different multi-locking doors to even get into our apartment. The big deck is also AMAZING! We loved sitting out there and having some wine in the afternoon. We definitely enjoyed staying in San Telmo - compared to a few other parts of BA, it almost feels like another country with all of the incredible old buildings... it is a very beautiful part of town! All in all, a very cool, funky little apartment in a fun part of town... the owner even organized a taxi for us to the airport at the end of our stay - super friendly, responsive, and made us feel like if we had any immediate problems (which we didn't), it wouldn't be difficult to find help. ADORABLE APARTMENT!!! I cannot say enough good things about this place. If you're looking for character and charisma, look no further. Between the large terrace/balcony, the bright colors of yellow and blue, the vaulted ceilings and the huge bathroom, we could not ask for more. The owner is very fun and helpful. Would recommend in a heartbeat! This flat in San Telmo is in a great location for the district. The woman who let us in was very kind and showed us everything we needed. We felt very private, secure and comfortable. This place has everything you need for a comfortable home like stay in Buenos Aires! Departamento muy hermoso. Estoy encantado. La dueña es atenta y de gran ayuda. 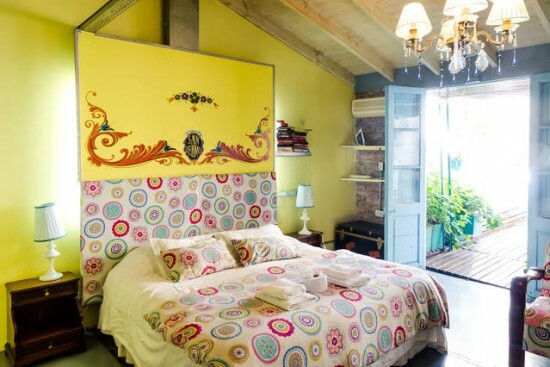 A charming appartment in the middle of San Telmo! What else can you ask for? Only sorry we found this only now. For two persons this is a gem, everything you need you will find there. Around you , you will find shops for all you needs , food, wine, beer fresh bread for breakfast. With all the fantastic restaurants nearby you will not cook dinner, but refreshments with a small bites on the terrace both before and after will be on your agenda! Great location. Bars and restaurants steps away. With cafe one block away selling coffee and 3 fractures(pasteries)for 10 pesos why cook breakfast. Bed comfy. Staff helpfull. 2 flights of narrow stairs so if not good on stairs think again. Staff always willing to help would and have recommended to my friends. We really loved that apartment in the lightblue house.The cosy terrass is well furnished and the small lamps under the roof makes it even better in the evenings. The bathroom was really big an very good. The staff in the same house was wonderful and very helpful.The stairs could be a problem for some people.This part of San Telmo is perfect for a longer stay. We will come back. The apartment has everything it needs, but besides this it is beautifully decorated and has the best rooftop terrace. I hope to come back soon! The apartment is very nice, clean and has a good atmosphere. We enjoyed the big, sunny balcony with the lovely flowers. The staff was friendly, thank you! We liked to stay in the apartment very much and would like to return any time again. Muchas gracias! Nice and charming apartment. Big balkony, good bathroom. Well situated in San Telmo.